The gilt head sea bream gets its name from, and is easily identified by, the gold colouring on the side of the head and the distinctive gold band between the eyes. 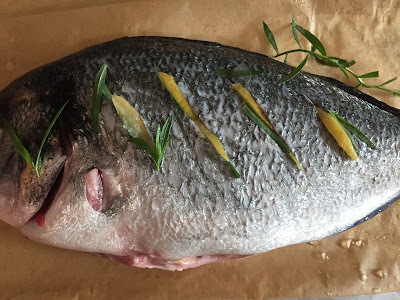 It is generally regarded as the best of the breams for eating, although I recall Rick Stein waxing lyrical about the dentex on one of his Mediterranean adventures, describing it as better than sea bass and saying that gilt head sea bream came close in flavour. We have eaten dentex in Spain (dentón) and I don't wish to enter into the dentón versus dorada debate except to say they are both excellent! Gilt head sea bream is found in British waters and is readily available in the UK. 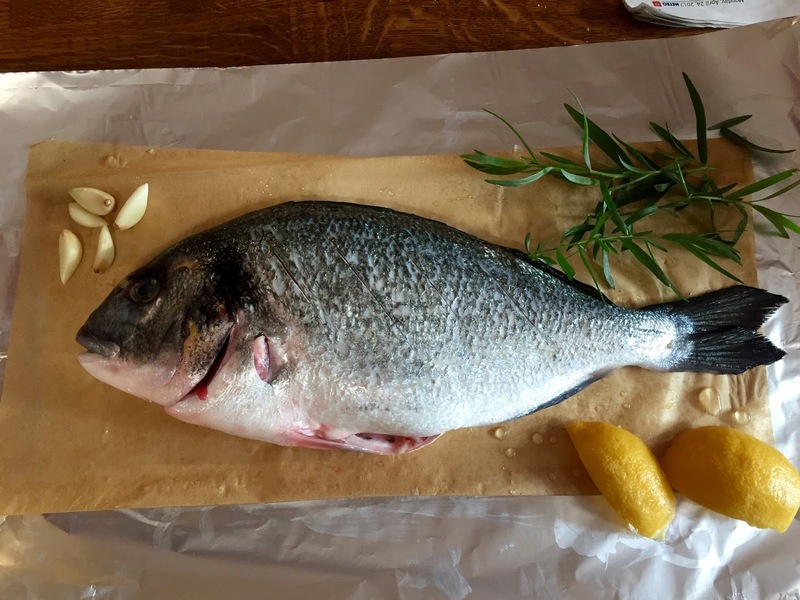 It is common throughout the Mediterranean - (dorada in Spanish, daurade in French and orata in Italian) and is farmed extensively in Greece. All the breams can be successfully roasted, baked, grilled, poached whole or pan-fried when filleted. On this occasion, I chose to roast in a parcel - you may see such recipes described as en papillote in French restaurants, al cartoccio in Italian. I had some fresh tarragon in the garden, some recently harvested garlic from the allotment and a jar of home preserved lemons in salt. A perfect combination. 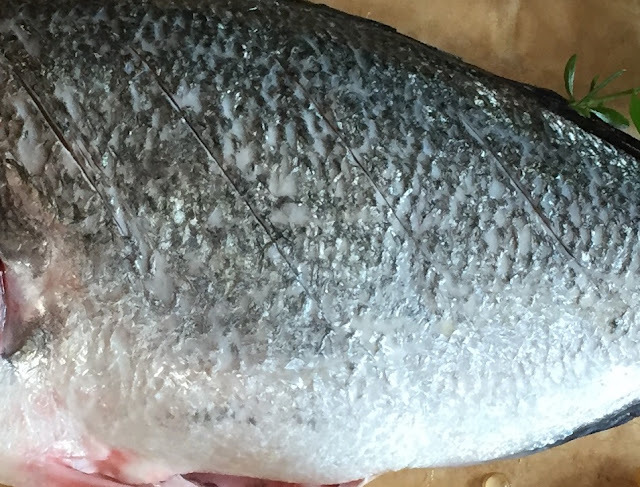 Gut, scale, trim the fish and remove gills - or ask the fishmonger to do this for you. 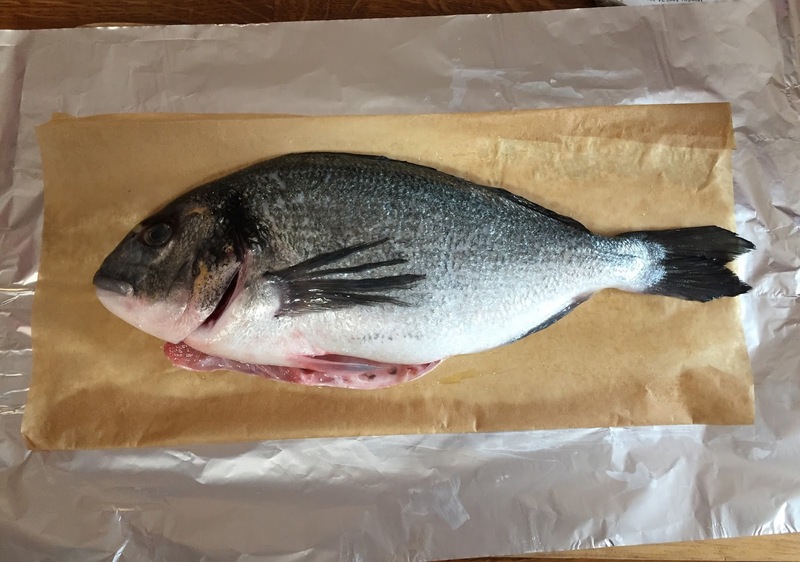 Cut a rectangle of grease-proof/baking paper slightly larger than the fish and place on a sheet of foil large enough to wrap round the fish. Make deep diagonal slashes on either side of the fish, down to the bone. Peel and cut the garlic into thin slivers. Remove flesh from the preserved lemons and discard. Rinse the peel well in running water and cut into thin slivers. Stuff the slivers of garlic and lemon and tarragon leaves in the slits on both sides of the fish. 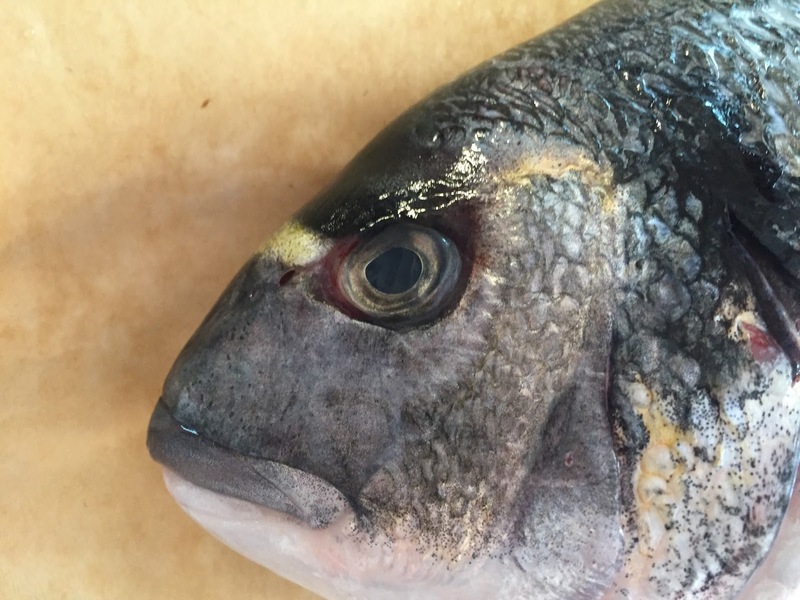 Place any remaining tarragon, garlic and lemon peel inside the body cavity and on top of the fish. Fold the foil over the fish to make a neat sealed parcel, but do this loosely so the fish can steam as it is cooking and will remain moist. Heat the oven to 180C. Place fish on a baking tray and cook for 15 minutes. You may wish to open the parcel for a few minutes towards the end of cooking - a) to check that the fish is cooked and b) to crisp up the skin. The top fillets can easily be removed and placed on a serving dish, then the central bone can be easily removed to access the two remaining fillets. Pour over any juices from the parcel and serve.